Lots of excited Sooke and Victoria anglers are sharpening their hooks ... the opening of the halibut fishing season has been announce. Halibut fishing opens again on March 1st. There are many fantastic halibut fishing spots in central-eastern Juan de Fuca Strait. Watch for a calm sunny early Spring day and get out there! If you are not an experienced halibut fisher, then consider getting a local fishing guide to take you out. 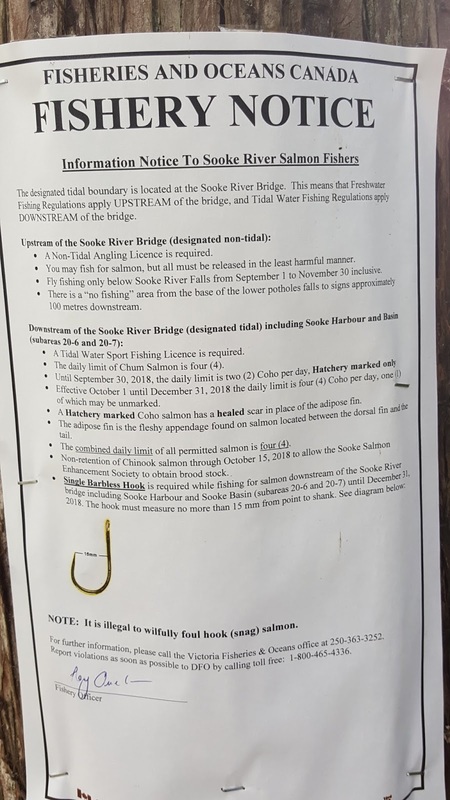 This is a fishery where knowing the hot spots makes a huge difference, as well as the correct tides/currents when the halibut will bite. Optimal halibut fishing requires anchoring up, to focus on a spot and allow a scent trail to bring them in. Anchoring is currents is one of the most dangerous aspects of recreational boating ... so if you aren't experienced, better to go with someone who is and learn the ropes! Have fun and good luck out there. 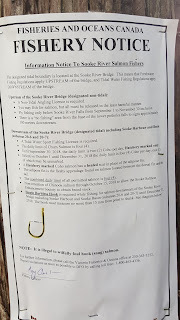 2018/2019 Tidal Waters Sport Fishing Licence. Too many people think the fishing season ends September 1st. The salmon fishing in winter can be really good in the waters between Sooke and Victoria. There are resident "feeder" chinook salmon that are here year-round. They hunt for their needlefish and other bait right off the bottom, so a troll 10' above the bottom with a hootchie or spoon can yield great results. 120-150' is most common. Though the schools move around, sometimes hanging around Sooke's bluffs or the trailer park, other times down toward Oak Bay, so you have to look for them. It's fishing, not all catching! The other surprising thing about winter fishing is that a sunny but low temp winter day with no wind can actually be warmer than those bone chilling damp foggy August days - seriously! Here's a fine winter spring for a grateful guest of No Bananas Fishing Charters. Check out the other Sooke and Victoria fishing guides for your winter fishing adventure. Here's a great video from Paul Keene. Fishing off Race Rocks, between Victoria and Sooke, they got a great show from an orca / killer whale. That pays for a day out on the water, any fish caught are a bonus! Halibut has closed for the season, the chinook salmon have mostly headed up to the rivers to spawn, but the good news is the coho are here! The reports vary daily, but most anglers are coming home with a few. Last weekend the reports said the fish were found in tight pockets, so as long as you stay with the school, there was plenty of action. 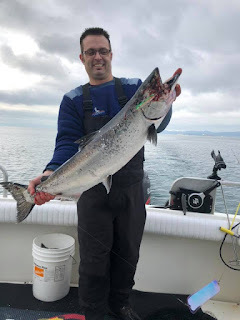 One angler reported catching a 15lb hatchery coho! 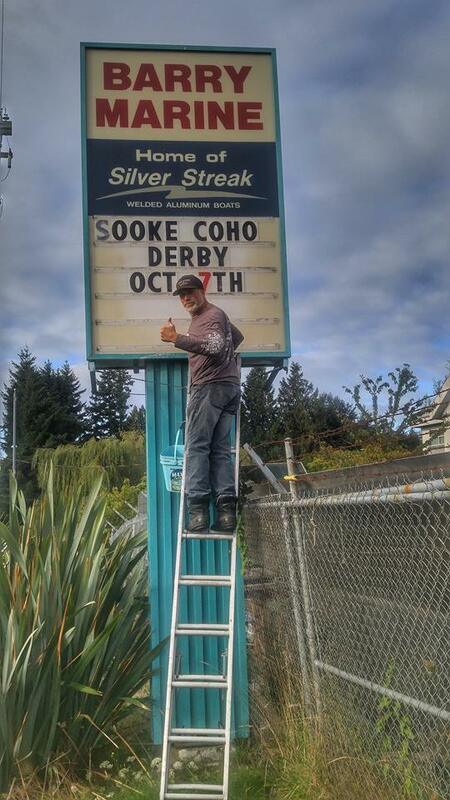 Sooke Saltwater Series continues on October 7th with the coho derby. $50 per rod, $3000 first prize. 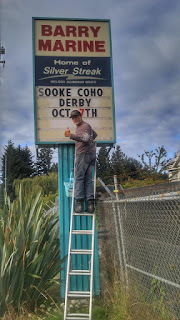 This is a fun event that benefits local Sooke recipients, the Food Bank and Sooke Salmon Enhancement Society. Tickets and more info here.